In a previous article I wrote about public school versus home school and Christianity. The topic of public education, specifically, public ed reform and Christians, has been on my mind ever since. I came across another article recently that provides a helpful framework for Christians to think about engaging in public education reform. The article, “Understanding the Church’s Cultural Mandate and the Great Commission” is not specifically about public education reform, but I think it can help Christians understand why they should be part of the movement to reform public education in the U.S. The post, by Rev. Mark Creech from the Christian Post, talks about the intersection between social action and evangelism. Creech says that Christians have sometimes put working for social good and the biblical commission to tell others about Jesus Christ at odds. This is a false dichotomy, he says, and Christians need to show Christ’s love in both word and deed. Here’s an excerpt that explains how proclaiming Christ verbally and in action actually work in concert. As I applied Creech’s thoughts to public education reform, a few thoughts struck me. So any Christian who has been born into a new life of faith in Jesus Christ must also imitate Jesus’ compassion toward the weak and the hurting. Few places are as rife with brokenness as the public education system in the United States, so every Christian should prayerfully consider how to work for justice in schools. 2. “Social activity can be a bridge to evangelism.”— In my years as a public school teacher, I knew that my occupation was to educate my students in the required curriculum. But as a Christian, I know my calling is to make disciples of Jesus Christ (Matthew 28:19). I was grateful in Christ to have many opportunities as a teacher to share my faith. I didn’t do it in the classroom. I didn’t forge an unconstitutional connection between Church and State. But in the relationships I formed with kids and their parents, questions about my beliefs came up naturally. So I had the chance to tell them about why I lived the way I did, and the Savior who daily gives me hope and strength to work for good in the world. If Christians are concerned about evangelism, they should see the organic connection between improving public education and the occasions it creates to tell people about Jesus. 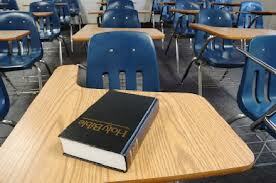 In my experience, some Christians object to public education on ideological grounds. Taking prayer out of public schools and a secular humanistic agenda run contrary to their beliefs. I’m a Christian. I believe in prayer, and I believe in God’s explanation of creation, what’s wrong with it, and how to fix it. I also believe that God wants us to love our neighbor, even if that neighbor happens to be in a public school. And especially when our neighbor is trapped in a broken school system that too often leads to more brokenness in the world. So, let’s refrain from pitting a social good like public education reform and evangelism against each other. Instead, let’s obey both the command to make disciples and the command to fill the earth and cultivate it in the name of Christ (Genesis 1:28). Previous postPublic School vs. Homeschool: What’s a Christian to Do? Jemar, thanks for the article. I wrestle with this issue frequently. We get off-balance, I think, especially when we’re admonished by some to “keep the main thing the main thing.” The gospel is all-inclusive, isn’t it. Blessings to you, Brother. David, thanks for your response. I can relate with your wrestling. There’s sometimes a tension between evangelism and social action, but we have to somehow do both if we’re going to imitate Christ. I appreciate you taking the time to read. Grace to you! In the Old Testament, God gave guidelines such that the means of economic self-sufficiency would stay within a family. Because they were basically an agrarian society, it was important that the land — the means of production would not be permanently lost to a family. The guidelines stipulated that even if the land was sold it would be returned in the year of Jubilee. Though we are no longer an agrarian society, I see a close analogy b/n the land and an education. It is virtually impossible for someone or a society to thrive without a good education. This is why I believe Christians should support education as a public good. (I understand there is a long distance b/n supporting public education generally and supporting what is going on in a particular school.) Deciding that the education of children is something that we all should support can be a clarifying first step in thinking about our individual posture towards public schooling. We have utilized home schooling, private schools, and public schools in the education of our children. I can talk at length (and sometime do!) about the strengths and weaknesses of each. I’m leery of any advocate that can see only a single approach as correct.